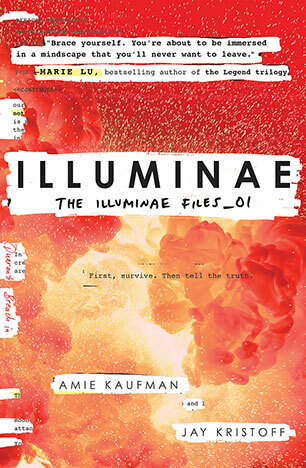 Illuminae states its intention right from the cover, which is covered in scraps of partially redacted documents. The book itself is told through a series of recovered documents of varying types, many flagged with introductory comments. The form of narrative has been done before and it is worth saying at the outset that Kaufman and Kristoff do it very well. Despite lots of goriness and evil goings on, all swear words are redacted to keep this closer to PG than MA territory. The main characters are two seventeen-year-olds who have just broken up when they have to survive an attack that destroys their home planet – an illegal mining colony in the far reaches of the universe. They are rescued and end up on separate ships in a fleet of three trying to outrun a battleship bent on their destruction. Both are likeable characters – Kady the techno-hacker chick with a healthy disregard for authority and Ezra, the jock with a heart of gold – and the narrative constantly flicks between the two. Through all the mayhem that follows, their relationship issues are never far from the surface. Kaufman and Kristoff have fun with a bunch of sci-fi sub-genres. Illuminae has Battlestar Galactica-style rag tag space battles, a HAL-crazy Artificial Intelligence, and shifts gears to a 28-Days Later-style zombie thriller about 1/3 of the way through. But all the time, deep down, it is a teen romance, complete at one point with digital rose. Illuminae is squarely pitched at the Young Adult market. Not only the characters but the style which suits the social media generation. No section/document is longer than a few pages and much of the “dialogue” is in text-speak. Which is kind of ironic because if the past is anything to go by, it is highly unlikely that teens hundred years from now will still be using the same text-speak and emoticons we use today. Quibbles aside, as some local audience testing has proved, this book is certain to be a hit with its target audience and one that sci-fi loving adults can guiltily enjoy too. This review first appeared in Aurealis #87, Australian Science Fiction and Fantasy Magazine. Illuminae was awarded best Science Fiction novel at the 2015 Aurealis Awards.